As a full service advertising agency, we have the pleasure of working with many types of businesses. Working with and watching a NEW business open its doors for the first time is a special pleasure for us. We get to see all their hard work (and ours) on public display for the first time. It is also one of those times that we see the planning and strategic work we have done with the client, come to life in the marketing materials we have created to bring their new brand to its intended audiences. Developing a brand is much more than a name or a logo, though those are usually part of it. A brand is really a business’s promise to its customers – who they are and what they stand for. To get to that promise, the important question for us is not “what (do they do)?” but “why (do they do it)?”. We’ve found that every successful business is driven by people with a passion for what they do, whether that is serving fine food or manufacturing specialized mining products. When you capture the source of the passion, you capture the brand. 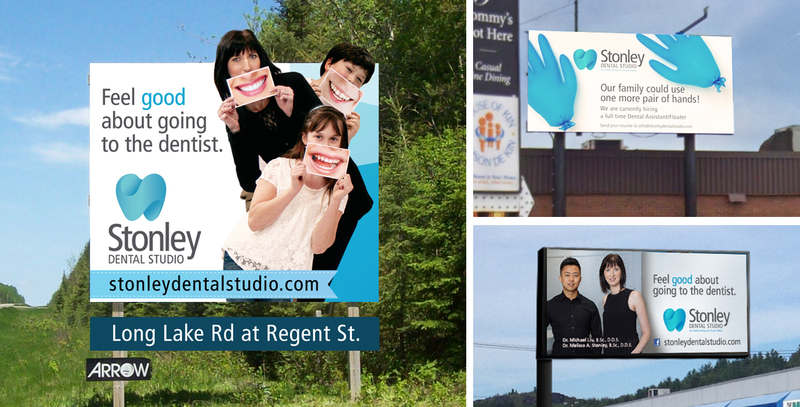 As a “soon to be opened” dentistry practice in Sudbury’s south end, the passionate people at Stonley Dental Studio came to Petryna Advertising for “the full treatment” – brand development, strategic marketing plan and execution of a full marketing campaign to introduce them to the public. The process started with “why”; what makes Stonley Dental Studio special? It didn’t take long to find the answer. We found the answer in one word – family. We found a staff who treated each other like family, and wanted their clients to feel like family. And we found a focus on family dentistry – an understanding of the needs of young children and young families and of how those needs change over time as a family grows and matures. The promise became a brand: “Our Family Taking Care of Your Family”. With the “why” in place it was time to move on to the “how” – the practical details of bringing the brand to market. A logo was developed to support the brand, and marketing materials to support both the brand and the practical realities of the marketplace were developed. In addition to demographics (young families), geography was another key driver of the campaign. Targeting our efforts in the area of the practice – Sudbury’s south end – allowed us to concentrate our efforts and maximize the effectiveness of the marketing budget. For the initial launch, this meant using clearly targeted media like localized mail drops and out-of-home media like billboards and highway signs. Of course, the campaign also included elements designed to reach the entire community, from radio to a website to social media. The campaign was also carefully designed to move from an initial launch to something that would support and sustain the brand for the long-term. Websites and social media can provide great results for businesses, but they need careful planning to make sure they remain effective and don’t become stale. The role of websites has evolved with the increased use of social media, but certainly not replaced. Websites remain a key reference tool for consumers – the main go-to for further information. That’s why it is essential that websites be kept up to date with current information, from staff changes to new services. 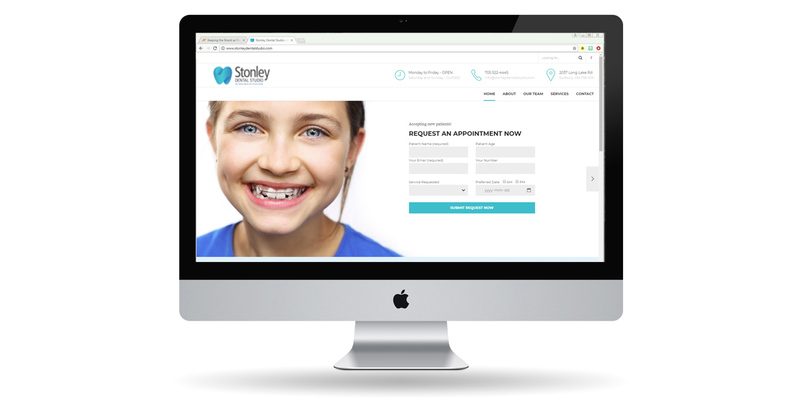 Besides creating a look and feel that supports the brand, our website for Stonley Dental Studios was carefully designed so that the Stonley team are able to quickly and easily update information and make changes on their own. Once the site was launched, we provided training to make it easy for them to take charge of keeping the site fresh and up to date. Social media is a huge opportunity for most businesses but also a significant challenge. It provides the opportunity to target information by demographics and geography and is widely used by younger consumers. However, to be effective, it must be used consistently. That is why we created a social media plan and schedule for Stonley Dental Studio. The plan was supported with templates to make posting easy and to keep a consistent look. This helps keep the social media presence on track for an extended time period to keep followers informed and to continue to build a following. One of the special pleasures of working in a full service adverting agency like Petryna Advertising is that you get to be part of the full process, all the way from initial planning and brand development through to creation of campaign material and on to handling of ongoing support of things like the website and social media to the client to carry forward. 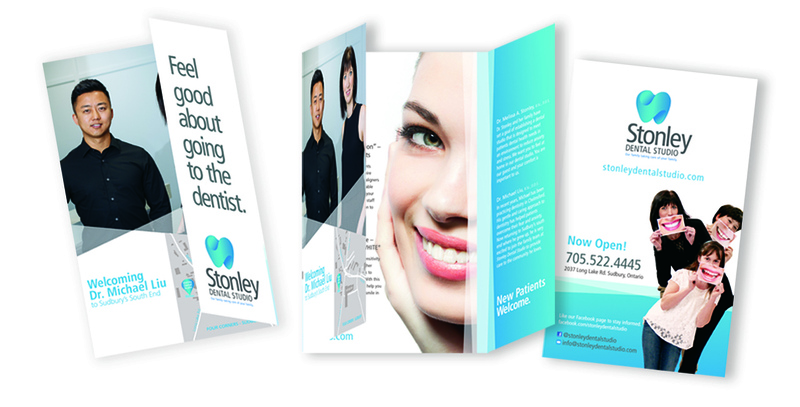 Stonley Dental Studio provided one of those great opportunities. We continue to support them as we help them undertake new marketing initiatives and watch their business grow as new clients discover why they do what they do.